Dollar General Corp. (NYSE:DG) stock was on its way up today following the release of its earnings report for the fourth quarter of 2017. Dollar General Corp.’s strong same-store sales for the fourth quarter of the year was one thing pushing DG stock higher today. The company’s same store sales for the quarter were up 3.3%. Same-store sales reported in fiscal 2017 were up 2.7%. Earnings per share reported by Dollar General Corp. in its fourth quarter of the year was $1.48. This is down one penny from its earnings per share of $1.49 from the same time last year. However, it matches Wall Street’s earnings per share estimate for the quarter. Dollar General Corp. reported net income of $712.16 million for the fourth quarter of 2017. The retail company’s net income from the fourth quarter of 2016 was $414.18 million. Operating profit was $623.45 million for the period, which is a drop from the $680.62 million in the fourth quarter of the previous year. During the fourth quarter of the year, Dollar General Corp. reported revenue of $6.13 billion. This is better than the company’s revenue of $6.01 billion that was reported in the same period of the year prior. Despite this, it came in below analysts’ revenue estimate of $6.21 billion for the quarter. Dollar General Corp.’s outlook for the full year of 2018 is another high point for DG stock today. The company is expecting earnings per share for the year to range from $5.95 to $6.15. Wall Street is looking for earnings per share of $5.58 for the year. DG stock was up 4% as of noon Thursday. 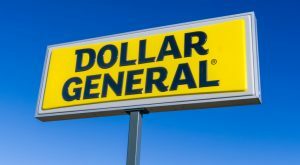 Article printed from InvestorPlace Media, https://investorplace.com/2018/03/dollar-general-stock-up-on-q4-report/.